At first, we were completely culture shocked. I had never had culture shock before on trips around Europe and the Americas, so it was an odd sensation. I basically spent the first 3 days taking the place in and trying to understand the place, where non of my mental constructs for the social system would fit what I was seeing, so I had to build them from scratch. The place is on another scale, there’s simply no comparison with anywhere else I’ve been too, it’s like the city in the film Judge Dread, just they haven’t got flying cars (yet). Dubai Marina, isn’t my cup of team, but the cheer amount of of buildings soaring 300-400m is mind boggling. This impression was especially poignant when we came through Lisbon on the way home. On the train deck of the 25th April bridge I was imagining these building soaring past dwarfing everything in the city bellow, even the hills it’s built on. Dubai will blow you away when you go there the first time. It’s like no where else. Dubai is not exactly my cup of tea for sure; give me big mountains over big buildings any day, but it does possess an allure and a sense of ‘thing happening’. This is the same culture we appreciate when visit the places like the mosque in Cordoba or the Alhambra in Granada. It’s the same culture that over a thousand years ago opened the very first universities and possessed an inclusive multicultural make up all those years ago. Me and Catarina weren’t in full ‘race mode’ (I sold it as a ‘Honeymoon’) so we enjoyed a trip down to the souks by the creek a couple of days before the race. These are markets where you can buy spices, gold, gems and cloth (silk, kashmir, etc). This was one of the highlights of the trip for me. I loved getting stuck in and lost, looking at all these things, as if I’d stepped into a story tale adventure. We took a little boat across the crowded creek which was really cool. I didn’t have much patience for haggling -time is more valuable that money in my book, but Catarina had great fun doing it. The place has a wonderful human element. If you thought London was multicultural, you ain’t seen nothing yet and the mood is mostly very positive. Everyone there has a purpose, they’re there because they wanted to go there and they are there doing something productive. It’s easy to criticise the evident class system at first site but even the people doing ‘grunt’ work take home more pay than most people in Portugal. Ironically Dubai seems to be sucking up a lot of the most educated and talented people while the idiots in Europe let the social situation decay further and further. 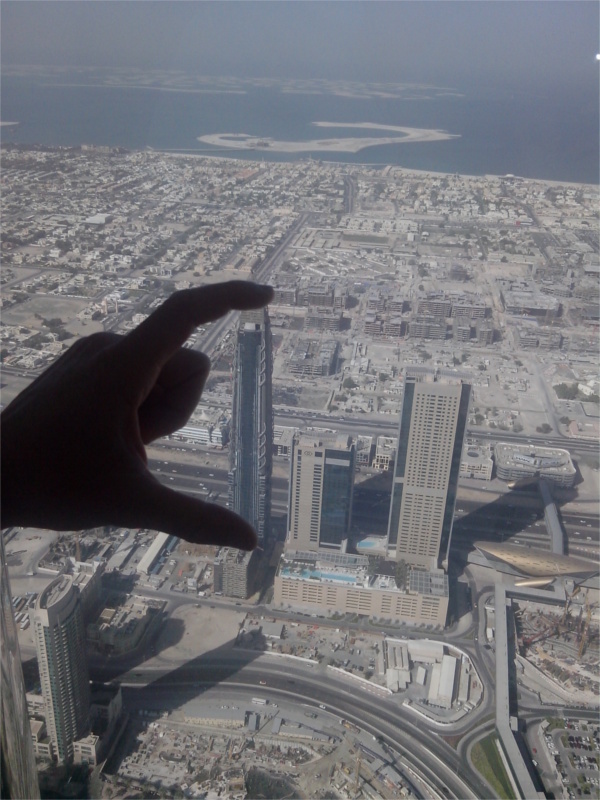 After the race we went up the Burj Kalifa, the tallest building in the world. So big in fact it doesn’t really process… I still have no objective perception of the size of the thing, if that makes any sense. it’s a bit like being in a plane. For sport Dubai offers great facilities for running and swimming. In terms of cycling it has designated cycling tracks, which are amazing, but I still prefer the liberty of cycling on the road. Most importantly of all however, is the human factor, Dubai is full of interesting people interested in doing interesting things and this positive vibe more than makes up for the down sides. 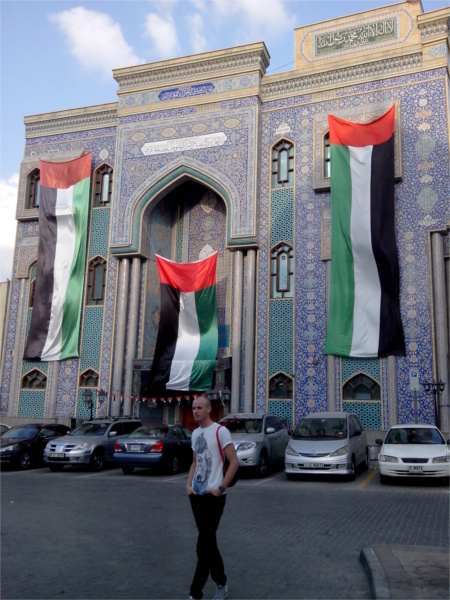 I preferred Bahrain to Dubai, it’s a little more down to earth and the people we met were very friendly. We stayed in an aparthotel (which turned out not to be an aparthotel) a bit out of the way and got to see the place from an interesting perspective we wouldn’t have seen otherwise. We were the only Europeans to be seen. The place is a little more composed than Dubai, while maintaining some of that crazy bling factor. We were mostly consumed with getting ready for the race, which involved a lot of coach trips up and down the island since taxis are unbelievably expensive on weekends there. But the parts of the place we did see, we really liked. The race organisation itself was mind blowing. 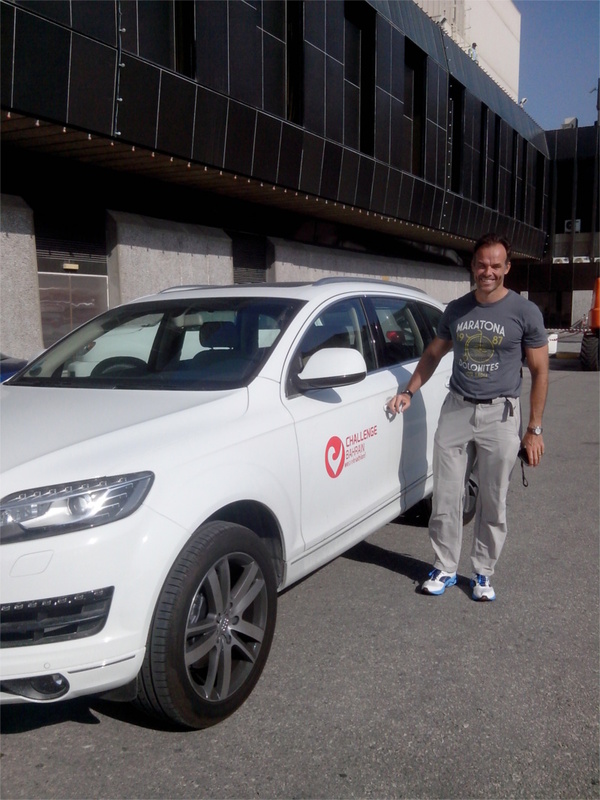 We were driven to our hotel by new Audi and the formalities of registration and that were pretty straight forward. The only problem was certain things (bike mechanic, registration) were 37km away from the swim start and T1. While the food and everything was second to none, some little details escaped, such as bottled water at the start and more portaloos…. There was about 10 between 1000 nervous triathletes. The race divided into heats, with the pros chasing the big money being the first off at 7:30 I was a little later at 8:10, the pro’s were super fast in the water, with the front group doing about 21:30-22:00 for the swim, which is comparable to Olympic distance swim speeds. I was in the sub 4:40 heat with the Prince. The run I paced carefully as I wasn’t familiar with the course, I could have gone a bit faster, but decided to focus on eating and getting to the end well. I didn’t want to risk breaking the engine. I finished in 1:24 which I was pretty happy with. I didn’t have any issues with foot injury which was cool and dropped speed only very slowly over the course of the run. I felt I could have risked more and gone faster. All in all I finished in 4:08:43, I’ll aim to mix it with the pros in 2015. I’ve got a lot room for improvement. I’m fairly confident I can cut it in this new sport. I predicted my times basically to the minute (okay, 4:10 not 4:08) but I had a solid idea of what I could do. In future I’m going to look to improving swimming to 25′ -I’ll call it ‘project 25’ and keep a training vlog on it.I know that doesn’t seem a huge difference, but it is, it’s a 16% improvement. A good wetsuit will be part of this equation. In running I’m going to do a lot more slow volume, since the little bit of this I did do seemed to benefit me tremendously. My aim will be to easily run 33′-34′ for 10 km and do this consistently. I found that my performance in the Triathlon was only slightly impaired compared to normal running (about 3-4%) and that pace is competitive in 70.3 distance races. You wont see me running 1:10, but hopefully 1:15-1:17. That’s roughly 8-11% difference, the difference is I’ve gone this fast before and ‘know’ what it should feel like. In terms of cycling I am going to get back on the old road bike and work on sustainable power and agility. My biking is significantly weaker than when I was a cyclist. In my last test up Foia I was 3 minutes slower than before (440w vs 390w). The TT bike obviously doesn’t help when climbing, but I’d like to get back up to a level a kin to that that I had as a cyclist. Improving the bike (machine) is also going to be an issue. Obviously mine is a bit of a dog and while this isn’t a massive issue, there’s a good few minutes in getting a better frame and better handle bars. With these things I will be more or less on parity with the top guys. I reckon I can manage 2:00 for 90km on the bike which is an 8% difference and ‘doable’ with the right tech and slightly better form. That still wont win me the top races, but I’ll be able to mix it up with the top guys. So the plan for now is to rest up for the rest of the week, then get started in the pool and the gym. I’m going to try to put more effort into the swim, swimming five to six times per week, which is five times more than my average these past few months. Gym will be frequent too. It’s very important and I’ve been really sloppy with my strength training in particular. I will also be putting in a fair bit of running. and not much cycling. This is the plan for the next 6-8 weeks. Regardless of what happens race wise, I’m splitting the season in two, so it like two small seasons with a month off/easy in June/July followed by a build up for Bahrain again in 2015. Obviously this is still just a dream, but I why not give it a go?! I’ve dedicated my life to sport and was not always treated fairly, now at least I can enjoy it and do my absolute best. Triathlon is just about doing your best and that’s what makes it both tantalising and beautiful to take part in. I’d like to get a ‘pro’ licence (harder than it should be given my background) and race more in the middle east while continuing to develop academically and ever improve SMS the training services and the information provided. A massive thanks to Chris and Islay, who were fantastic hosts and without whom we would never have been able to do any of this. As Catarina later affirmed it was the ‘best Honeymoon ever’! Certainly for it it was the best honeymoon and holiday full stop, it was really cool. It also made a fantastic way to round out my first year going triathlon.